Those who shivered through the recent frigid and long-lasting winter can perhaps look forward to a reprieve from the onslaught of the Polar Vortex, the National Oceanic and Atmospheric Administration said Thursday in its newly released winter climate outlook. 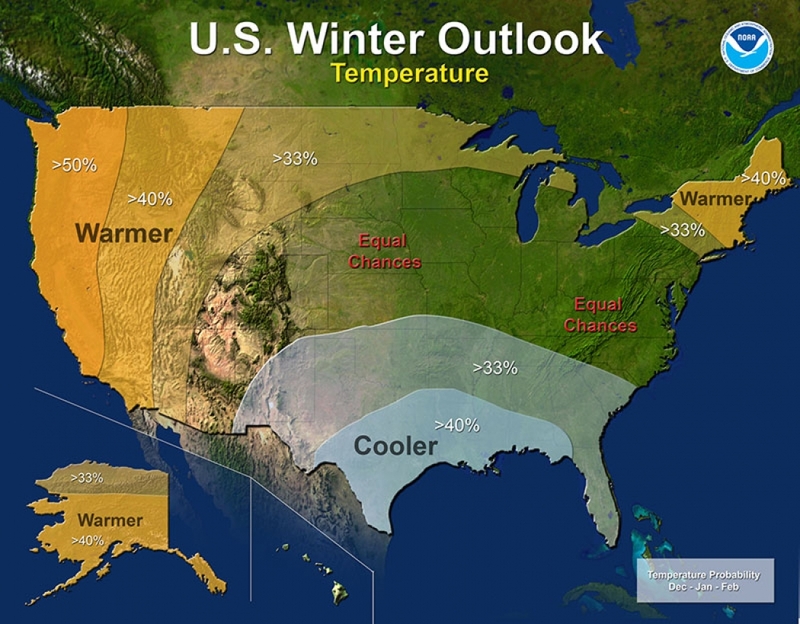 Expected trends in temperatures during the 2014-15 winter. “At this point there’s nothing that indicates we’ll see a repeat of that,” said Mike Halpert, acting director of NOAA’s Climate Prediction Center. That said, it will be winter and winter is, well, cold. It's also the type of year when incursions of Arctic air are most likely, although it appears unlikely last winter's pattern of frigid temps will repeat itself. “I would never say anything is impossible, but I would certainly say unlikely,” Halpert said. Halpert also cautioned that “those kinds of really extreme type winters . . . are pretty much impossible to forecast.” The repeated incursions of the vortex weren't anticipated last year. Though NOAA expected parts of the Northerns Plains to be unusually cold, the Northeast was expected to have a warmer-than-normal winter. Though last winter felt extreme (and the Polar Vortex pattern was unusually persistent) in the eastern portions of the country, it was actually only the 34th coldest in the 119-year NOAA records. It only felt so cold in part because winters have been warming overall in the U.S. (as well as across the globe) as greenhouse gases accumulating in the atmosphere trap more and more heat. The winter outlook that NOAA puts out each year can’t tell us whether there will be big blizzards in Chicago or ice storms in Atlanta. Instead, it is what forecasters call a “probabilistic outlook” — it can only tell us what is more or less likely to happen compared to the normal winter climate in regions of the country. “It’s important to realize that the nature of a probabilistic forecast means that other outcomes are always possible, just less likely,” Halpert told reporters during a press briefing. Thursday’s release looked not only at what broad temperature trends were likely across the country, but also at where winter precipitation was likely to be above or below normal. The big story for precipitation is in California, where a severe drought has entrenched itself over the past few years, and where winter is the prime month for precipitation that could help relieve the drought. Forecasters are limited in how much they can say about the coming cold season because of the lack of strong climate signals from El Nino and other factors “that give us clues to what the season will bring,” Halpert said. The El Nino that has been struggling to form for the past six months has yet to fully emerge, and when it does, it is expected to be only a weak event. The winter impacts associated with weak El Ninos are less clear-cut than those associated with strong events. 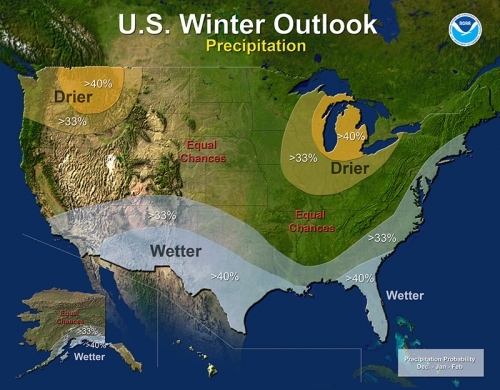 But, with the information they have, the winter outlook “does favor above-average precipitation across the entire southern tier of the nation,” from Southern California to Florida and up the Eastern Seaboard, Halpert said. On the flip side, below-average precipitation is expected in the Great Lakes region, Hawaii and the Pacific Northwest, which could intensify the drought that has crept up from California into Oregon. “The rest of the country . . . falls into what we call the equal-chance category,” Halpert said. In other words, it’s equally as likely that those places will see above- or below-normal precipitation. Expected trends in precipitation during the 2014-15 winter. Though Southern California could see some boosted precipitation this winter, NOAA expects the drought to persist in much of the state, as detailed in their Drought Outlook for the nation, also released Thursday. The key to moving out of the drought is a healthy snowpack in Northern California, and there is no clear signal on what winter may bring there. Even a normal precipitation year for the state won’t erase the drought, which covers all of California. “There’s still going large parts of drought in California when the winter’s over,” Halpert said. The drought picture isn’t all bad though, as “we do see some removal or improvement across the Central and Southern Plains,” said Kevin Werner, western regional climate services director with NOAA’s National Climatic Data Center. Some less intense drought in the Northeast is also likely to be erased, he said. In terms of temperature, the one part of the country that could see chillier-than-normal conditions is the southern tier from New Mexico through Arkansas and over to South Carolina and Florida, according to the outlook. On the other side of the temperature coin, the western portions of the country, as well as the northern Midwest and the Northeast, could see warmer-than-normal winter temperatures. The rest of the country has equal chances of either outcome, so you may still want to get out the sled and the long underwear.